The Prime Minister was in Glasgow last night at the end of a tough week personally, but politically one in which there are signs that Labour is narrowing the gap on the Tories at UK level. He also had a good story to tell to the Scottish Labour audience given by-election successes and a strong poll rating, well ahead of the SNP and the Tories. Given the seemingly endless media drivel about Gordon’s personality, it was good to see the Prime Minister in a relaxed and positive mood. Perhaps because I usually see him in settings when he is amongst friends, I see a different personality from that portrayed in the media. Last night there was genuine humour, but also a real passion about his decisions during the economic crisis and his concern for the human impact on workers and communities. I don’t always agree with the Prime Minister tactically, but I have never doubted his commitment to Labour values. The audience last night were left in no doubt of where he stands and they responded warmly to both the message and the man. Yesterday I was speaking at the launch of new guidance to manage occupational violence in Scottish local government. The document was launched by the Cabinet Secretary for Justice with supporting contributions from CoSLA and ourselves. UNISON Scotland publishes an annual survey on violence at work. Last year we indentified over 25,000 violent incidents in the public sector of which nearly 10,000 were in local government. Of course these are only the recorded incidents – many more go unrecorded. Our survey has shown that local government is lagging behind other sectors. In particular a number of councils have poor recording systems and limited monitoring. As a consequence we argued that new guidance was required for local government. A task group led by the Scottish Centre for Healthy Working Lives including council safety staff and myself developed the guidance. It is a practical toolkit that builds on best practice and shows how councils can build effective strategies for tackling violence. The starting point is to raise awareness of the issue and there have been a series of national publicity campaigns in recent years. Despite this we still have some way to go in changing a management culture that in some departments discourages reporting and positive action. Education and social work departments are a particular problem because most violent incidents are instigated by cared for persons. Strengthening legislation is another priority. The Cabinet Secretary for Justice has agreed to extend the scope of the Emergency Workers (S) Act (EWA) although progress on this has been slow. We are also supporting a private members Bill that will extend the provisions of the EWA to a much wider group of public service staff in the public and private sector. The focus yesterday was rightly on the practical measures councils can take to tackle violence. The guidance calls on councils in partnership with the trade unions to review their approach against the best practice in the guidance. We may never eradicate violent incidents, but we can minimise them. This guidance shows how to do that. Scotland has arguably the strongest climate change legislation in the world in the Climate Change (Scotland) Act. The legislation commits Scotland to reducing emissions by 42% by 2020 and 80% by 2050 - targets which are among the most ambitious in the world. Targets are important but delivery is what matters. To that end we lobbied successfully for a statutory duty on public bodies to take account of climate change in the exercise of their functions. The Scottish Government is now developing guidance on how public bodies should deliver on this duty. Yesterday was the first meeting of the Advisory Board tasked with preparing that guidance. It includes representatives of all the main groups of public bodies and myself representing the Stop Climate Chaos Scotland coalition. The first meeting was an opportunity to explore different approaches to the construction of the guidance. There will be a number of informal stakeholder workshops in March followed by a formal consultation later in the year. The guidance will come into effect on 1 January 2011. Today the UK Committee on Climate Change reported that the Scottish target was "feasible but difficult" without a wider international agreement. Professor Jim Skea from the committee said: "A step change will be needed to unlock potential emissions reductions in Scotland, but we believe this to be achievable with new policies." He went on to say: "Given a new policy framework the opportunities are there for Scottish people and businesses to drive down emissions and build a low-carbon economy." That is certainly right and as usual it will require the public sector to lead by example. 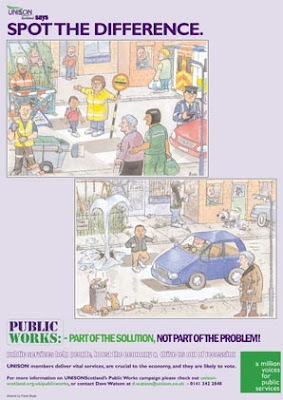 Launched our latest Public Works publicity initiative today, including an advert in this week's edition of the Big Issue. It's called Spot the Difference and shows a before and after picture of what Main Street Scotland could look like without public services. We were in Edinburgh on Saturday supporting the Scotland United march and rally against racism and fascism. 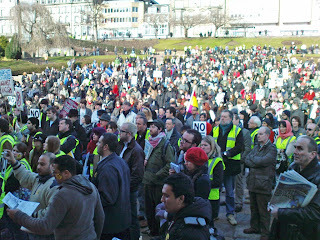 The march was called to counter plans by the so called Scottish Defence League to march in Edinburgh. In reality this is the English Defence League, a particularly nasty BNP spin off. About 100 turned up in the city and spent a few hours corralled in pubs before heading back down south. Same result as in Glasgow last November, when they last tried to show their faces in Scotland. 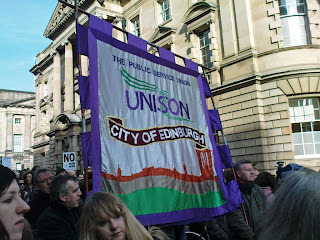 In contrast over 2000 people turned up to the Scotland United rally to hear speeches from the Cabinet Secretary for Justice, the Leader of Edinburgh City Council and Scottish Labour Leader Iain Gray amongst others. The key message is that we won’t allow Nazis to terrorise our communities. 2-0 to Scotland – don’t bother coming back. A Labour Party meeting this evening in Glasgow for trade union members. This is an opportunity for members in this constituency to quiz the Scotland Office Minister Ann McKechin and me. I am doing a number of these meetings across Scotland as Secretary of the Scottish Trade Union Labour Party Committee (STULP), in the run up to the UK general election. Members are rightly critical of some aspects of government policy and it is important that we recognise that fact. It is our job to represent these concerns to ministers through the party structures and ministers will acknowledge that we do that at every opportunity. Equally it is important to give credit for the benefits a Labour government at UK level has brought to Scotland and in particular to workers. Union recognition, safety legislation, protection for pensions and the minimum wage are just a few. There is always a real understanding at these meetings that a Tory government would put these gains at risk. By pulling the UK out of the EU social chapter, paid holidays, parental leave, pay equality and even basic employment rights would be at risk. The latest proposal is to remove even health and safety inspections through a system of self regulation. Tonight’s meeting is not far from the Stockline plastics factory explosion where nine workers died and many more seriously injured. Self regulation doesn’t wash here. Despite this understanding just not being the Tories is not enough. If union members are to turn out to vote in large numbers they need to be inspired by a Labour Party that is in tune with our traditional socialist values. I was speaking at the APSE housing seminar today in Peebles. This was a panel debate with the Housing Minister and the housing spokespersons for the main political parties. This was a good opportunity to set out UNISON Scotland’s vision for housing in Scotland. Housing in Scotland has changed enormously over a relatively short period. In 1983 half of Scots rented council houses. Today two out of three are home owners and half of social housing is in the not for profit sector. However, the main challenges remain. Demand for housing remains high with more than 150k on housing waiting lists. This problem has been exacerbated by the recession with private house building down 30% and social housing down 7% last year. Whilst there have been real improvements in the housing stock, there are still too many damp and unsuitable houses, and a £1bn maintenance backlog. I set out UNISON Scotland’s solutions to these challenges. The priority should be a focus on housing investment with 10,000 new houses for rent each year. These houses should primarily be in the council house sector with a level playing field for new investment between housing associations and councils. In addition there should be an end to housing stock transfers coupled with debt write off for those councils who retained their stock. Of course this will only work if we curtail the right to buy – a real prospect with the Housing Bill currently before parliament. It is not just what we build, but how we build. New houses need to be built to higher standards with a real emphasis on tackling fuel poverty and meeting Scotland’s ambitious climate change targets. New housing should be fully integrated without the spatial segregation that has characterised social housing in Scotland. There was a good debate covering methods of financing, responses to the recession and the role (if any) of the Scottish Futures Trust. There is broad agreement on a vision to raise housing quality, build sustainable communities and ensure that an affordable home is within everyone’s reach. Sadly there is far less consensus on the means of achieving the vision. This morning I was at a cost sharing sub group of the Scottish Local Government Pensions Advisory Group (SLOGPAG). This is the body responsible for Scotland’s largest pension scheme. Unlike many public sector schemes this is a funded scheme administered by 11 different funds, with a common set of regulations agreed nationally. In 2008 we negotiated a new Local Government Pension Scheme for Scotland (LGPS). We also agreed to look at coast sharing mechanisms and governance arrangements in time for the next scheme valuation in 2011. These are complex discussions looking at how we calculate any movement in the assumptions that underpin the cost of the scheme (longevity, pay rises, inflation etc) and how those costs are shared between employers and scheme members. We made progress in narrowing down the options and further work will be undertaken on these before a formal consultation later this year. These discussions have to operate in the context of a malicious campaign by business groups attacking the allegedly “gold plated” pension schemes like the LGPS. Let us have your definition of a "gold-plated" pension. Would it be £50,000 a year? £20,000? £10,000? Would you drop as far as £3,800 a year? That is the actual level of the average pension for local government workers - £3,800 a year. It is "more tin-foil than gold-plate", as UNISON's General Secretary Dave Prentis has said. On Saturday I was at the Scottish Labour Party’s Policy Forum. This is the body tasked with drafting Scottish Labour’s policy programme that leads to the manifesto for the 2011 Scottish parliament elections. It is made up of elected representatives from CLPs, affiliated organisations and MSPs. I have been a critic of many aspects of this approach to policy development. However, the reforms UNISON and others promoted in recent years have undoubtedly strengthened the Scottish process. One of its strengths is the involvement of organisations outside the party in the first stage of the process. This generates good ideas and opens up the party to thinking outwith our normal comfort zone. Other political parties in Scotland do very little of this and as a consequence have very insular policy development. The Policy Forum is now at stage two of the process. This is when the Forum has taken on board the ideas generated in stage one and produces a revised consultation paper. These are drafted by elected policy commissions to be approved at Saturday’s meeting. They cover the full range of devolved policy issues – so it was a long meeting! One of the risks of this process is that each area of policy is considered in isolation. The result can be a long list of worthy policy initiatives that don’t have an underlying set of values. It is therefore important that you start with shared principles and then regularly return to them to see if what you have agreed is consistent with those principles. This is arguably what happened with the 2007 manifesto and we will need to be vigilant to ensure it doesn’t happen again. A good example of this is the debate around targeted v universal provisions. It is tempting when looking at specific areas of policy to look at how you can get best value, particularly in the current economic climate. No serious political party wants to make promises it knows it can’t keep. This leads to calls for targeted provision. However, the problem for a socialist party is that this undermines the solidarity society we want to achieve. Public services for the poor and disadvantaged in the long term become at best a poor safety net, because they lose the support of the majority who don’t use them. On a couple of occasions on Saturday I could almost hear Cameron’s policy strategists cheering us on down the targeted road. That is how they want to break up the social solidarity that Labour has created with institutions like the NHS. So a long way to go with this policy process, but we need to keep our shared values foremost in our minds. Whilst recuperating from an operation I am perhaps not surprisingly attracted to health issues. The "Fair Society, Healthy Lives" report, published today by Sir Michael Marmot, of University College London, says that, despite life expectancy for the worst-off improving by 2.9 years in the last decade, "up to 2.5 million years of life are being lost each year in England as a result of poor people dying prematurely". The position in Scotland is if anything even starker. Healthy Life Expectancy (HLE) in Scotland is 55.9 years for men born in the most deprived areas. Men born in the least deprived areas have a HLE of 73.3 years. That’s more than 17 years longer. Of course the link between ill health and social class is not new. The last UK Labour Government in the 1970’s commissioned the Black Report on this issue. This report was completed when Thatcher came to office and she sought to bury the report by only publishing a few photocopies. One of our partner unions NALGO stepped in and published it properly. Not that it changed many Tory views. I well recall as late as the mid 1990’s the Tory Chair of Glasgow Health Board denying publically any link between ill health and social class. Other more recent work points us to solutions. I covered the Fabian booklet The Solidarity Society in an earlier post. My personal favourite is The Spirit Level by Richard Wilkinson and Kate Pickett. This detailed international research shows why more equal societies do better at almost every measure including health. This shows that tackling inequality is not just a good thing for the ‘deserving poor’. It helps everyone and builds a stronger healthier nation. A rare experience for me this week as I experienced an NHS hospital at the sharp end – as a patient. My reaction is the same as most patients - no I was not a ‘customer’. Excellent facilities staffed by highly professional and caring staff who did all they could to ensure everything went smoothly for me. This reflects the formal patient surveys that regularly report satisfaction levels that most marketing managers in a commercial setting can only dream of. I was in hospital when the Scottish Government launched their Quality Strategy in a bid to drive up standards. Under the new plans the Cabinet Secretary wants patients to become “partners in their own care” with hospitals and GPs scored on their services. The language ‘Partners’ is absolutely the right one because that is what I and thousands of patients who use the service every day are. I am a little more sceptical about scoring systems. They tend to lead to league tables and management responses to ‘play the system’ that can distort real priorities. The main problem facing NHS Scotland in the coming years is budget cuts. As we indentified last week in local government there is a major disconnect between the Scottish budget and those of health boards. At a national level the health budget is going up, yet most health boards are planning to make major cuts next year. Not a lot of detail as yet, but it is something we will be monitoring closely and building into our cuts campaign. In the meantime my personal thanks to the NHS and its staff. Labour’s finest political achievement, the embodiment of the solidarity society, and a service well worth defending. We are holding a rally in Glasgow today to highlight the cuts planned for public services in Scotland next year. We have published a summary of cuts assessments prepared by our branches, based on the discussions they have been having with public bodies across Scotland. This shows a very different picture from the broadly standstill Scottish Budget agreed last Wednesday. In local government alone we have identified spending cuts of over £300m, that is six times greater than the cut in local government allocations in the budget. As a consequence over 3500 jobs will go from local councils next year. For other services the budget process is much less advanced but early returns indicate a very similar picture in health, police, utilities and education. This isn’t just a tragedy for the staff concerned. Important local services are being cut and there will be a big knock on impact on local economies. For every pound spent by public services, 64p goes back into the local economy. So job losses will multiply at a time when we are still struggling out of the recession. Spot on. Let’s here more from all political parties about pay freezes for the bankers and the neo-liberal economists whose ideology got us into this mess. I made a presentation today at the PCS Scotland Privatisation Forum on Scottish perspectives on privatisation. The forum started with an interesting historical look at the failures of privatisation, that reminded me of my own unions history. NUPE (one of UNISON’s partner unions) earliest battles were intensively political struggles. The intrusion of private contractors and the profit motive into public services was as familiar to trade unionists in Victorian Britain as it is today. Early campaigns for dustmen and sewage workers focussed on wages and conditions of those employed by contractors. My presentation set out the context in Scotland today. Whilst we have a strong public service model, there are the usual vested interests driving privatisation on the back of budget problems. Armies of management consultants are gearing up to make money out of the public purse. I set out UNISON’s approach including our strategic campaign – Public Works, local campaigns, our approach to procurement and of course the importance of union organisation. There will be no easy pickings in Scotland. There followed a useful debate that highlighted the common challenges all public service workers face in Scotland. It is budget day in Scotland. The politicians are haggling over a few tweaks to what is by any standards a tight settlement. The UK Government is tightening their budgets too soon in the economic cycle and the Scottish Government is making some poor allocation decisions, particularly the Council Tax and business rates freeze. But the real story is outwith the Scottish budget. The demands on public authorities, particularly councils are growing much faster than the modest national allocations. This means all public authorities are planning budget cuts way in excess of the Scottish budget allocations. That means cuts in services, jobs and the consequential impact on the Scottish economy. As we have said in our response - it looks like a triple whammy for the people of Scotland. I had a meeting with Lord Hunt the UK energy minister this morning in London. Most of UNISON members in Scotland are covered by the Scottish Parliament so we have less contact with UK ministers. The exception is energy, although there are also significant devolved responsibilities. It was a useful meeting and a pleasure to meet a UK minister who had a good grasp of Scottish issues. We had a general discussion on energy policy including the importance of clean coal technologies (CSS) to Scotland and the need for a planned and balanced energy policy. Much of the meeting focussed on our concerns over energy regulation including the recent distribution price review and Ofgem’s plans for locational charging and transmission loss. Put simply we believe that energy transmission charges should operate on the postage stamp principle i.e. you pay the same wherever the electricity is generated. Energy has traditionally been an important Scottish export and could be even more significant if the renewable potential is fully exploited. Ofgem’s plans discriminate against Scotland and could strangle the renewable energy industry at birth. There are encouraging signs that the UK government recognises that the market alone will not deliver the certainty needed for new energy generation including CCS, nuclear and renewables. In an interview with The Times yesterday, Ed Miliband signposted this welcome change of direction. This is a position we have advocated for many years (see UNISON Scotland energy strategy). Not quite the planned energy policy we would want, but an important step in the right direction. Train journey to London today. Compared to air travel, I love the train. Glasgow to central London in under 5 hours, none of the hassle, normally on time, environmentally friendly and you get real work done. No competition in my view.  Scotland has 40% of the UK’s PFI school schemes and they are generally larger than similar schemes in England.  There was minimal competition. Only 7 of the 37 contracts had the recommended three bidders. Even this is generous as councils counted bids that were never going to be realistic.  There are long and expensive bidding processes costing upwards of £1.5m per project all of which has to be recouped in the contract costs. Costs also escalate during the bid process. The Clackmannan scheme went from £35.8m to £72.7m at financial close. £10m of that took place after the preferred bidder had been selected. The consequence is that PFI costs will capture an increasing proportion of council school budgets as we enter a period of overall cuts. Scotland’s greater dependency on PFI is one possible explanation for the scale of education cuts we are seeing at local level, when the Scottish Budget is not reducing at the same rate. The article concludes by lamenting the fact that the Scottish Government’s new PFI arm (Scottish Futures Trust) is not learning the lessons from these past mistakes. No doubt the bankers and consultants will have moved on by the time the next generation has to pick up the bill.